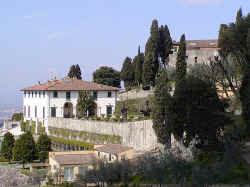 The Villa Medici at Fiesole is one of the oldest Renaissance residences with a garden and is also one of the best preserved, but at the same time one of the least well known. While most of the villas dating back to the same period, such as Cafaggiolo and Trebbio, stand at the centre of agricultural concerns, Villa Medici had no connections at all with farming life. The villa was built during the mid 15 C when Cosimo the Elder employed Michellozzo di Bartolommeo to design it for his second son Giovanni dei Medici. Intended to be a setting for intellectual life rather than a working Villa, Villa Medici was constructed to be a demonstration of aesthetic and ideological values. It owes its fame to Lorenzo il Magnifico who inherited the property in 1469 following the untimely death of his brother. The new master of the house turned the residence into a gathering place for artists, philosophers and men of letters such as Marsilio Ficino, Pico della Mirandola and Angelo Ambrogini, known as Poliziano. The quadrangular building is a typical 15 C edifice, with square pietra serena windows and broad loggias looking out over the surroundings. 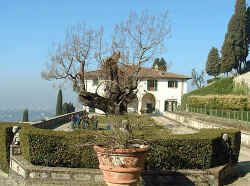 The villa remained the property of the Medici until 1671. It subsequently changed hands several times, and in 1772 was sold to Lady Orford, the sister-in-law of Horace Walpole. In the 19 C it was owned by the artist William Blundell Spence and in 1911 was purchased by Lady Sybil Cutting, wife of the writer Geoffrey Scott and mother of Iris Origo who spend much of her childhood here. The entrance, which used to be on the Via Vecchia Fiesolana, was moved by Lady Orford in 1772 onto what is now Via Beato Angelico, a change which altered the entire organisation of the villa. At the same time a limonaia was built to a design by Niccolò Maria Gaspare Paoletti. The geographical position of the villa on gently sloping land suggested the layout of the garden on three terraces. The first of these, at the end of an avenue lined with cypress trees that runs underneath a holm-oak wood, has large rectangular lawns with potted lemon trees. The villa's piano nobile looks out onto this part of the garden. The second terrace is overlooked by the rear of the building and is reached by an indoor staircase. This, the least heavily altered part of the garden, has flower beds lined with box hedges with a large fountain in the centre, and is laid out in the shade of large magnolia trees. The third terrace, created between 1911 and 1923 by Cecil Pinsent and Geoffrey Scott, is aligned longitudinally with the first, but is 11-12 m lower down. It is laid out in the Italian style, with a fine pergola positioned mid-way between the two levels. 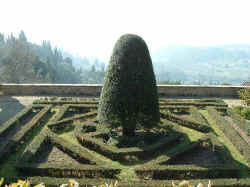 Oris Origo later employed Cecil Pinsent for the development of the wonderful garden at La Foce, her property in the crete senesi near Montepulciano. The art of the Italian villa garden. Visiting Florence and Tuscany? Stay in the country in your own vineyard apartment or farm house for less than the price of a hotel room. And often with a swimming pool! Fiesole © ammonet InfoTech 1998 - 2018. All rights reserved.